You can easily implement Pagination, Sort and Search functionalities in ASP.NET MVC. In this article I have used PagedList.MVC, Asp.Net MVC HtmlHelper method for generating paging control for use with PagedList library. Along with the Pagination functionality I have also implemented Sort and Search functionalities as well. 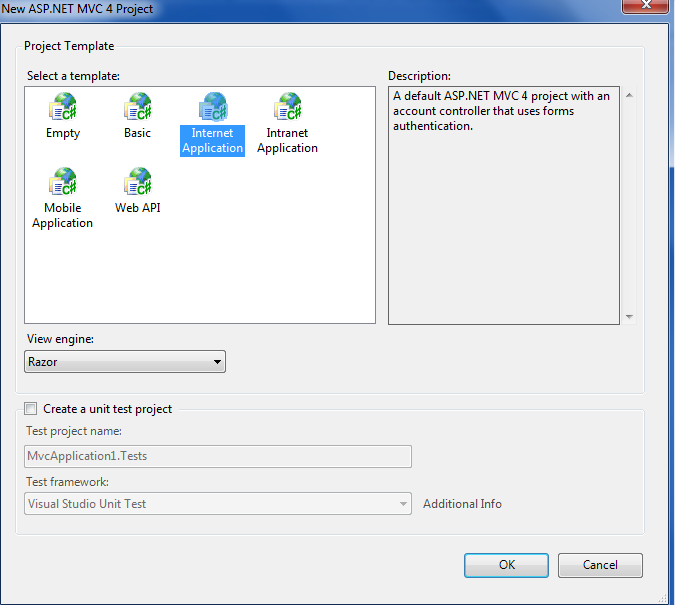 Create a New MVC project by selecting the ASP.NET MVC 4 web template from Visual Studio. Create a Sample Database and Table. If you want to use any other table please continue with that. Below is my sample table structure that I have used in this article. Below are the Code for loading all the Students from the database. I am using Entityframework for pulling data from the database. For pagination install a Nuget Package. Go to VisualStudio>Tools>Nuget Package Manager>Package Manager Console and Type command Install-Package PagedList.MVC and press enter. It will add all the references and css for the pagination you need. Run the application and give some value as FirstName and click Create button, a file will be downloaded in your local machine by writing the input text. If the user visit some other site or strict in picking up some html from a malicious source which had bad intention , then this malicious source can and provide a form just like a form that our application would given to the user and then if the user submit the form the call again will be authenticated because the authentication cookie be gave to the users browser always travel along every request and will save the information in to the database like we always do one we have authenticated request. Only the information in the request probably is in something user wants to submit. Someone strict the user in to transferring money or editing their account. The problem here is that not simply say we need the user to be authenticated when submit some information. We also have to be checking the information that the user is submitting coming from a form that our application presented to the user. We want to be preventing them when submitting the form from a malicious source. To demonstrate a CSRF I am applying the authorize attribute to my two Edit action methods of my application. In the developer point of view we are confident that I having authorized attribute in place for preventing malicious user from edit an Employee details. May be this link will you get from an email or from another website or some other areas of internet. Now I am going to click the link and seen a page will up. Now look at the record that we had saved earlier has changed. What happen? 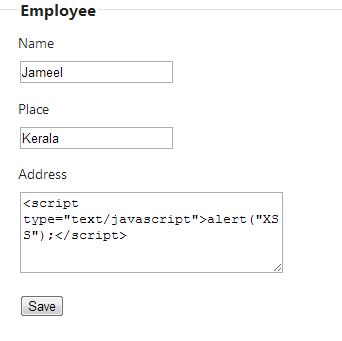 Use @Html.AntiForgeryToken() inside the form tag. This token will add a hidden input value that is unique to browsing session. Also sending a matching value in a cookie to the users browser so the user has accepts this cookie and that something malicious website would not be able to do. I again going to edit my record what the malicious user had done. Now I am going to click that link again and the ASP.NET MVC thrown an exception that AntiForgeryToken is not supplied or invalid. In this previous article you had read about XSS attack. 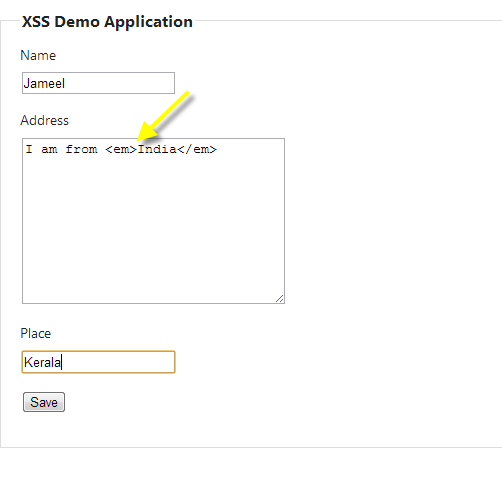 Now i am to explain an Anti XSS library from Microsoft to prevent XSS attack. It’s also more malicious. Fortunately Microsoft provide a library for prevent this. You can download it via nugget or Library Package Manager Console (Visual Studio>>Tools>>Library Package Manager>>Package Manager Console and type Install-Package AntiXSS and press enter). There are some specific threats we will face. 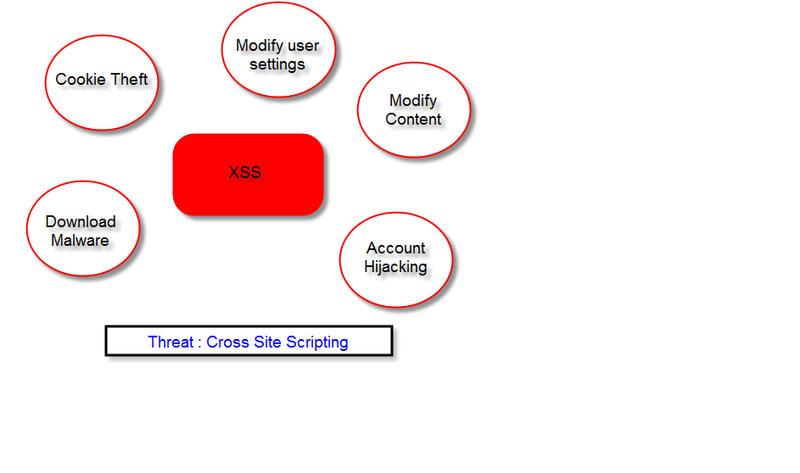 One popular attack of this phase is Cross Site scripting attack or XSS. In Cross scripting attack the malicious user will try to have your website load a malicious script in to the user’s browser. 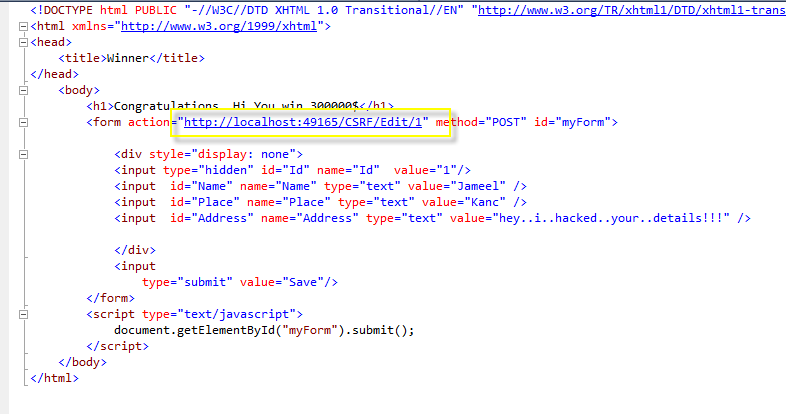 It could be a malicious script, active-x control and even some malicious html. The malicious scripts can theft the cookie, Modify user settings, Download Malware, Modify content. One of the worst cross site script attack is Account Hijacking; the malicious users can access the user’s credentials and personal information. Once this happen, your users become vulnerable to any number of problems. This is a simple application for saving employee information. 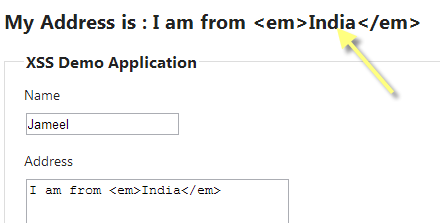 Let I am putting some html tag like I am from <em>India</em> and then I try to save this , ASP.NET automatically reject this request to prevent Cross site scripting attack because the ASP.NET is going to look for anything that resembles the html and just reject the request. Actually there is no wrong with the emphasis tag but ASP.NET is not trying to make a distinction here anything that looks like html is going to be rejected. Sometimes user need to upload some html in to the server then there are always circumvents this request validation. You have to extremely careful. One option is put ValidationInput attribute to the destiny here in Create action. Now we can have a problem that html encoded here this is because razor is going to encode everything by default which is good. There is another defense against the cross site scripting and we can fix that easily however the validate input false is completely disabling the check for cross site scripting malicious html and really we only need html inside of one specific property. So you can allow html to one property using AllowHtml attribute. 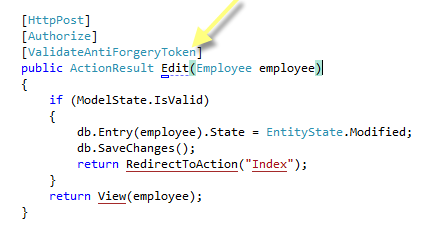 Also some changes need to be done, remove ValidateInput attribute from the Create action and also make sure that we should pass EmployeeViewModel class as action parameter that means model binding will takes place will move the html in to that property. Also one change in the view to show the html without encoding by putting ViewData in Html.Raw helper. And then again going to save one more and display the ViewData in the same view contain html tag. The authorize attribute also allows you to set some parameters to enforce authorization rules. First we need to know the user’s identity and then we can say only the specific identities to allow accessing these actions. 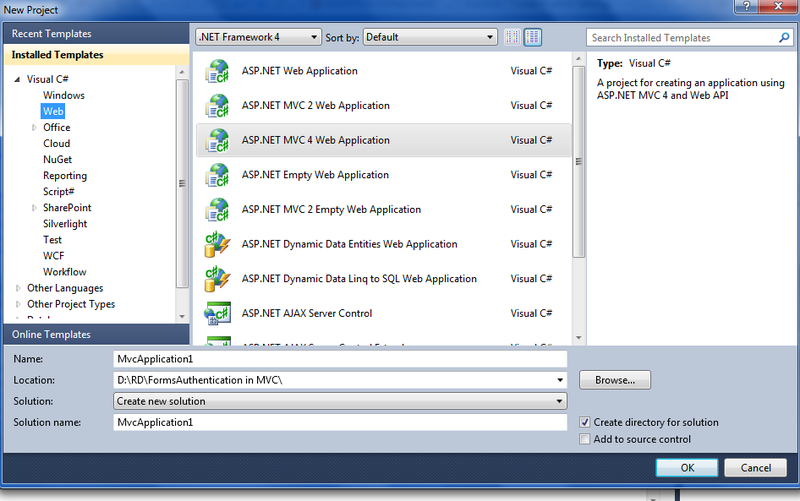 It launches ASP.NET configuration tool .This is the tool you are only going use in the local development machine. It’s going to look in the web.config location and use the same application services database as that Form Authentication provider of using that is already configured inside of there. You can add , manage roles from here. While doing these it automatically map to db we are configured in the web.config file. When you authenticate a user, you are verifying the identity of a user. If you need to verify a user in an MVC application it is probably because you are building an application that restricts access to specific users. This is completely separate from authorization, which is determining whether a specific person is allowed to do certain action. Form based authentication is providing an input form where users can enter the username and password with accompanying logic in the application needed to validate those credential. 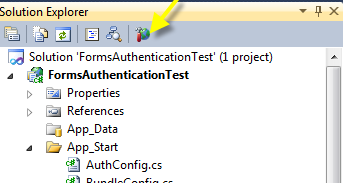 MVC provides a lot of infrastructure support for Forms Authentication. Forms authentication is highly customizable , you can customize everything from the sign in form, to where the credentials are stored and how those credentials are validated. Forms Authentication in ASP.NET relies on cookies by default. Once the user is signed in to an Application the runtime can issue a cookie on the browser. The browser will then send the cookie with every subsequent request to the application. ASP.NET will see the cookie and know that the user is already authenticate and does not need to sign on again. Note: word of warning , SSL is required to make Forms authentications secured. If you are running the application over http anybody snooping the network can see the users credentials. Windows Authentication is also known as integrated authentication because user components that built in to the Windows operating system are used to authenticate users . Once a user is logged in to a domain, windows can automatically authenticate them in to application. Windows Authentication is commonly used in Intranet Apps that run inside a company’s firewall where all of the users are logged in-to a windows domain. It will provide a single sign on experience.They sign on once in a domain and can be authenticate to several intranet apps. When we choose a Forms Authentication and Windows Authentication? If you want to build a public websites then Forms Authentication is best because it can be used outside of a windows domain. If you want to build an Intranet application which runs with windows identity use Windows Authentication. How is Forms Authentication configure? This bit of configuration tells runtime when we need to authenticate the user redirect the browser /Account/Logon. 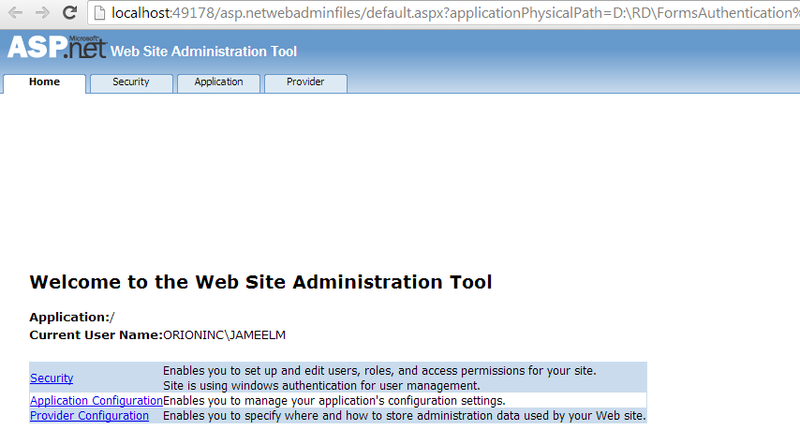 This Account controller and this Logon view as well as some other view allow me to register on site. 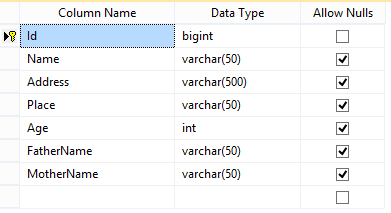 These things are provided by default in ASP.NET MVC internet template. Everything needed for the Forms Authentications are along with this template. view as well as some other view allow me to register on site. These things are provided by default in ASP.NET MVC internet template. Everything needed for the Forms Authentications are along with this template. And then select Internet Application Template which gives us to everything needed for the Forms Authentication like AccountController, Views etc and then click OK. The Authorize attribute doesn’t really care about how we authenticate a user. We can use a Form Authentication or Windows Authentication. All authorize cares about that the user does have an identity and we know whom they are and it’s not going to let a anonymous user get in to the Index action. When we going to take an index action without authenticating it automatically redirect to Account/Logonbecause the user has no account in this application. So we need to register for to Logon. How we are Authenticate with Windows Authentication? First we need to change a little bit in the configuration section like below in the web.config file. You can apply authorize filter to an individual action method or to a controller. 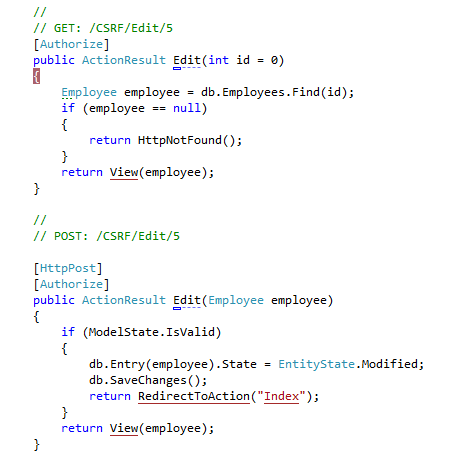 When you apply a filter to a controller, it works as though you had applied it to every action method in the controller class applied the Authorize filter to the class, so all of the action methods in the Account controller are available only to authenticated users. In order for windows integrated authentication works we need to enable windows authentication in IIS Express else we got the below error and this is the scenario you commonly face in today’s server configuration. Server programs’ like Web services and Database services typically have features turn off by default to reduce the attack surface. If we want to become Windows Authentication works we need to turn it on. Go to Document >> IISExpress >> config >> applicationhost.config file and windows authentication enable to true.